Comfortable, flattering pants can be challenging to make—but they’re wonderful to wear. In this book, David Coffin provides his inventive, sure-fire methods for getting it right. With his characteristic precision and straight talk—and with the help of photographs, drawings, and a series of video sequences on the accompanying DVD—Coffin teaches the reader how to get great results, whether making a showcase garment or just whipping out an everyday pair. 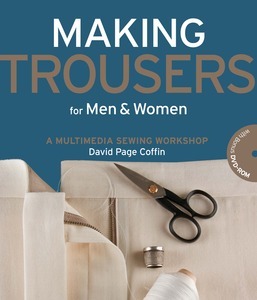 For more information and book-related extras, visit http://makingtrouserswithdpc.blogspot.com/, David Coffin¹s blog all about making trousers and specifically designed for the readers of this book.